Tens of thousands of dogs and cats are used in cruel and deadly laboratory experiments in the United States each year. Each one of the animals behind this statistic is an individual who matters. Yet in laboratories they are assigned a number and treated as though they were laboratory equipment. When they are no longer “useful” for the experiment, they are usually killed, discarded, and forgotten. 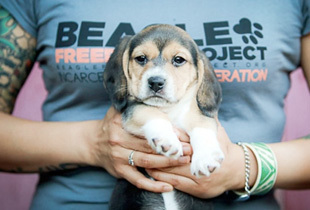 Beagle Freedom Project believes that all dogs and cats deserve Names, not Numbers, and that they have a right to a home where they will be loved and respected as an individual. We believe that dogs and cats should have an Identity, not an identification number. If it is your dream to adopt a laboratory dog or cat and you have been waiting for an animal to find his or her freedom to be their advocate, wait no longer. Beagle Freedom Project’s Identity Campaign will empower you to adopt a laboratory dog or cat while they are still in cages and work with us to fight for their freedom. 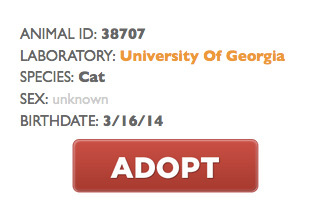 Use our Animal Finder to choose and “adopt” a dog or cat who is currently imprisoned in a U.S. laboratory. BFP gleaned the information contained in these databases through insider leaks and through public records requests filed with state and federal agencies. Due to logistical challenges and potential legal issues, only U.S. residents can participate in the Identity Campaign at this time. Continue the checkout process and purchase an individualized Identity Campaign Kit for $50. Included in this kit is your personalized adoption certificate and the Identity Tag for your adopted animal. Each Identity Tag is a unique, one-of-a-kind stainless steel engraved with the laboratory location and identification number for your adopted dog or cat. No two supporters can adopt the same dog or cat; you are your animal’s only advocate. 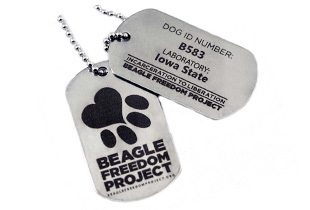 Beagle Freedom Project will help you find out more about the animal on your tag. If you chose a dog or cat from a public institution – such as a state university – we will assist you in utilizing freedom of information laws* to gather records for your animal. These documents – including veterinary records, health reports, and daily care logs – will paint a picture of what laboratory life is like for your adopted dog or cat. With your help, we can use this information to tell the stories of the dogs and cats who are languishing in laboratory cages at this very moment. Telling their stories will allow people to connect and empathize with these animals on an individual level. Fostering this kind of empathy is essential to realizing a future where every dog or cat has the right to be respected as an individual, and no animal ever has their worth reduced to that of a furry test tube with a number. We need your help to realize the full potential of the Identity Campaign. Let’s get started. *Please note that state open records laws permit government agencies to request a fee to cover the costs of compiling and copying records, and you may have to pay a fee in order to get more detailed records for your animal.